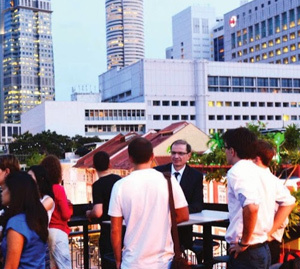 Grenoble Ecole de Management alumni gathered in Singapore to network and speak about their experiences. As Julie Perrin-Halot and Loïck Roche travelled from the mountains to the tropics, it was an opportunity to meet our many graduates settled in Singapore. The gathering took place on Thursday, April 10th at a rooftop cafe with a great view of the city. Over 30 guests from all of GEM's programs attended the event. With the tropical temperatures and the high level of humidity, everyone enjoyed the open space with a refreshing drink to ensure no one was dehydrated! The party reminded us of parties we attended in Grenoble except the dress code was slightly different and we never saw the DEAN at Aux Deux Colombes. The GEM alumni community in Singapore is fairly large with over 130 members. Organizing this kind of event helps alumni stay in touch and meet new faces while living abroad. We can say that our school's network is like a gem: precious and to be cherished. Thanks to all the attendees for making this event a success! " See pictures of the event.